Not every self-produced set by artist Bob Laughlin showed reverence to our National pastime and its players. Sometimes he broke out the pen and had a little fun. 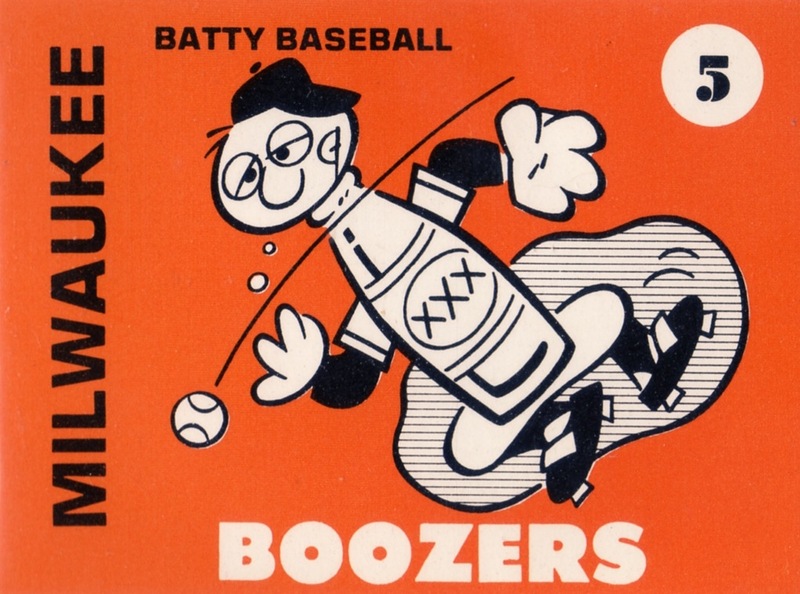 Baseball stadiums and TV broadcasts feature plenty of beer advertising, but folks don't joke much about "boozing it up" anymore, at least for modern-era players. We do see things like "BABE RUTH HIT HOMERS ON HOT DOGS AND BEER" and acknowledgement of past excesses, but calling the Brewers "Boozers" falls pretty flat today. In fairness to Laughlin, Batty Baseball throws change-ups, not bean balls. Most team get inoffensive names like "New York Mitts," "Baltimore Oreos," or "Minnesota Wins." Find a nice collection of scans (11 of the full 25-card set) at this Legendary Auctions lot. Speaking of Milwaukee, Brewers fans should check out Ride of the Ancient Mariner, a research series from blogger Mariner1. Its first two detailed posts shed light on Seattle's lengthy baseball past and amazingly inept team management surrounding the Pilots' one-year stopover on their way to Wisconsin. Value: The complete Batty Baseball set failed to get a $100 minimum bid at Legendary Auctions, hinting that individual cards go for $5 and under. I bought the Boozers for $2 at a show. It's an interesting look! I could imagine a spotlight-style modern insert set, if they haven't already jumped on that bandwagon.